A man from Genoa, Italy had been away from the church for most of his life. On one occasion, one of his friends asked him to deliver a letter to Padre Pio. Since he was not too far from San Giovanni Rotondo at the time, he agreed to do so. The letter needed an immediate reply. When the man knocked on the monastery door, one of the Capuchins directed him to the sacristy. “Just wait here. Padre Pio will be down soon to take the letter,” the Capuchin said. When Padre Pio came to the sacristy, he exchanged a few words with the man. Unimpressed by the encounter, the man wanted to leave the monastery as soon as possible. “I just need a reply to this letter and then I will be on my way,” the man said impatiently. “I understand,” Padre Pio replied. “And what about you? Do you want to make your confession while you are here?” “Oh no, I do not care to. I do not even go to church,” the man said. “When was the last time you made your confession?” Padre Pio asked. “It was when I was seven years old,” the man answered. Padre Pio suddenly became stern, “How long do you plan on living such a worthless life?” Suddenly a light seemed to penetrate the man’s mind. He realized that Padre Pio was right. He had been living a meaningless existence for years. All at once, he knew that he needed to change. The man made a sincere confession to Padre Pio and left the monastery completely transformed. Raffaele Scalzi invited an elderly friend to go with him to see Padre Pio. The year was 1958. Raffaele and his companion were able to greet Padre Pio in the corridor of the monastery. Padre Pio extended his hand to the elderly man to kiss but not to Raffaele. Padre Pio then continued walking down the hall. Raffaele felt very disappointed by the encounter. He wondered why Padre Pio had rejected him but had been so cordial to his friend. The next day, Raffaele and his friend left San Giovanni Rotondo to return to their homes. Once home, Raffaele could not get the thought of Padre Pio out of his mind. He had been shocked when Padre Pio withheld his hand from him. It caused him to take stock of his life. “May God enlighten you,” were the words that kept resounding in Raffaele’s mind. Why had Padre Pio said that to him? Raffaele admitted to himself that he was in great need of spiritual enlightenment. He was a non-practicing Catholic. His faith life had withered and died due to long years of neglect. Even though he had been baptized a Catholic, he knew practically nothing about the teachings of the Catholic Church. He had never had the slightest interest in studying his faith. Albino Luciani, the Bishop of Vittorio Veneto who became Pope John Paul 1. With great anticipation, Raffaele planned his next visit to San Giovanni Rotondo. The only problem was that he did not have the money to make the trip. It was expensive to travel from his home in Vicenza, in the north of Italy, down to the southern area of San Giovanni Rotondo. A short time later, one of Raffaele’s friends needed 500 lira and asked Raffaele for the money. Raffaele was not in a position to be giving money away. Anyway, he had decided to save any extra money that he could come by so that one day he could return to San Giovanni Rotondo. However, his friend was insistent. Raffaele finally agreed to give him the needed money. Not long after that, his friend returned and handed Raffaele 50,000 lira. He had won a large sum by choosing the correct numbers in a football betting pool. The unexpected money enabled Raffaele to travel to San Giovanni a second time. There were a number of men standing nearby, waiting in the confessional line. Raffaele was certain that they had heard Padre Pio’s strong words. But strangely, Raffaele did not feel the least bit embarrassed or ashamed. He was not offended by what Padre Pio had said to him. Quite the contrary, he felt a great happiness, a “celestial happiness” welling up in his heart. At that moment, he was exactly where he wanted to be. He was kneeling in front of Padre Pio, looking into his eyes, speaking to him. He could hardly contain his joy. One of the other Capuchins who was in residence at Our Lady of Grace monastery offered to hear Raffaele’s confession. Afterwards, Raffaele went out and bought a Rosary and a prayer book. Eleven months later, he returned to San Giovanni Rotondo and knelt before Padre Pio in the confessional once again. “Have you been attending Mass?” Padre Pio asked. “Yes, I have gone to Mass every Sunday since I last saw you,” Raffaele replied. 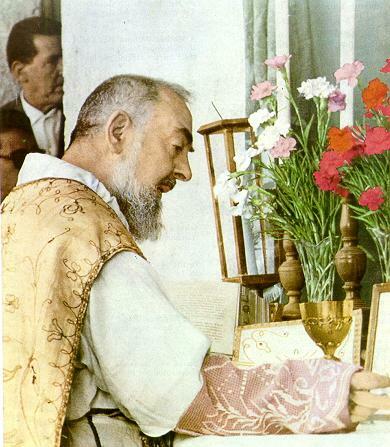 “Have you been attending Mass on the Holy Days of Obligation as well?” Padre Pio inquired. “Yes, I have also gone to Mass on every Holy Day of Obligation. I have not missed a single one,” Raffaele answered. Three times Padre Pio exclaimed, “Ah.” It was as though he was saying, “All is well now. All is very good.” For the next ten years, until Padre Pio’s death in 1968, Raffaele traveled twice a year to San Giovanni Rotondo to attend Padre Pio’s Mass and to make his confession. Frank Cavicchi had the highest esteem and respect for his spiritual father, Padre Pio. On one occasion, after Frank made his confession to Padre Pio, Padre Pio said to him, “When you go back to your home, I would like you to form a Prayer Group.” Frank agreed to do what Padre Pio asked of him. However, he really had no idea what a Prayer Group was or how to organize one. He imagined that it consisted of a group of people gathered together to pray but he was not entirely sure. As he was thinking about what Padre Pio had just asked him to do and wondering how he would be able to accomplish it, Padre Pio said to him. “Do not worry too much about it. You will manage.” To Frank, it almost seemed like Padre Pio had read his mind. As soon as Frank left the monastery he walked over to the administration office at Padre Pio’s hospital, the Home for the Relief of Suffering. It was the headquarters for the worldwide Prayer Groups. He spoke to the person in charge, Miss Lucibelli, and explained all that Padre Pio had said to him. She replied that Padre Pio was in the habit of giving out such tasks. “Do not worry,” Miss Lucibelli said. “Padre Pio knows what he is doing. Since he has given you this job, he will certainly help you to do it.” She gave Frank a booklet with detailed information about the Prayer Groups. He learned that he would need to receive permission from the Bishop of his diocese and would also need to find a priest to act as the spiritual director. When Frank returned to his home in Vittorio Veneto, he made an appointment with Bishop Albino Luciani. The Bishop listened to Frank’s request but refused the permission. He explained that there had been some unfortunate incidences with the Prayer Groups in the past. The bad conduct of some of the Prayer Group members had caused many problems in the diocese. Because of that, he could not agree to the request. Frank tried his best to persuade Bishop Luciani but he was not able to do so. He returned to his home feeling deeply disappointed. He dreaded telling Padre Pio the news. Padre Pio passed away on September 23, 1968. Almost one year later, Frank received a telephone call from the bishop’s office in Vittorio Veneto stating that Bishop Albino Luciani wanted to speak to him. When Frank arrived at his office, he was delighted to find that the bishop now expressed a sincere interest in the Prayer Groups. He asked Frank to send him all of the available information regarding the rules and regulations of setting up a Prayer Group. He would study the material carefully and if everything seemed to be in order, he planned to give his approval. At the conclusion of their discussion, as Bishop Luciani was walking Frank to the door, Frank began to tell him about his conversation with Padre Pio several years before regarding the Prayer Groups. Before he could finish his story, the bishop interrupted him. Perhaps he had a number of other appointments scheduled that day and simply did not have any time to spare for lengthy conversations. Shortly after that, Frank met with Bishop Luciani once again. “I give you permission to organize a Prayer Group,” the bishop said. “I entreat you, please do not allow any of the members to become fanatical,” he added. Bishop Luciani was evidently thinking of the unfortunate happenings from the past. Frank assured him that all would be well. Before parting, Frank said, “Your Eminence, if you had allowed me to finish my story when I last spoke to you about Padre Pio, you would have known then that you were going to be appointed the Patriarch of Venice.” Bishop Luciani smiled at Frank but said nothing. 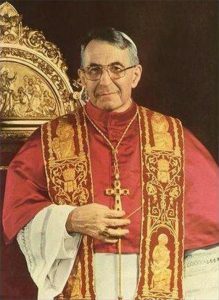 On March 5, 1973, Pope Paul VI elevated Bishop Albino Luciani to the rank of Cardinal. Cardinal Luciani was elected pope on August 26, 1978. He chose the name John Paul I in honor of his two immediate predecessors, Pope John XXIII and Pope Paul VI. Frank had the good fortune to be able to greet Albino Luciani, now Pope John Paul I, on September 20th 1978 in the Vatican Hall of Audiences after a Wednesday General Audience. Frank was with 150 other pilgrims from Vittorio Veneto, passing through Rome on their way to San Giovanni Rotondo for the occasion of the ten year anniversary of Padre Pio’s death. Pope John Paul I, often called the “smiling pope” because of his kindness and friendly demeanor was declared a Servant of God by his successor, Pope John Paul II, on November 23, 2003, the first step on the road to canonization. Capuchin Brother Christopher, OFM, Cap., was one of Padre Pio’s spiritual sons. On one occasion, when Brother Christopher was admitted as a patient to Sydney Hospital in Australia, he had the opportunity to witness a miraculous healing through the intercession of Padre Pio. There in Sydney Hospital, a young man about twenty years of age occupied a bed in the same ward that Brother Christopher was in. The young man had a good job as a clerical worker at the headquarters of the Peter’s Ice Cream Factory in Redfern, Sidney. Brother Christopher learned that he had been in the hospital for quite some time. The young man’s condition mystified the medical staff. His temperature use to rise to abnormal degrees, so much so that the nurses had to pack his body in ice in order to reduce his fever. He was unable to hold down any food. The young man’s condition deteriorated rapidly after Brother Christopher’s first ten days in the hospital. Brother Christopher promised Father Campion that he would do so. After Father Campion left, Brother Christopher remembered that he had a picture of Padre Pio with him which he had received from San Giovanni Rotondo. He had read of many accounts of miracles that had occurred when Padre Pio’s picture was placed under the pillow of a sick person. He gave the picture to the young man’s family and told them about the holy life of Padre Pio. They thanked Brother Christopher and said they would place the picture under his pillow. The young man was released from the hospital several days later, completely cured. Before leaving, he and his girlfriend came over to Brother Christopher’s bedside to thank him once again. They promised that they would return to the hospital soon to visit him. But before they were able to do so, Brother Christopher was also released from the hospital. Once when Padre Pio was a young priest, he visited a man who was gravely ill. The doctor confided to Padre Pio that the man would not last through the night. Padre Pio prayed at the man’s bedside and gave him his priestly blessing. “It would be a good idea if you made your confession now,” Padre Pio said to the man. “Oh no, I am not going to do that,” the man replied. “Maybe later, when I am feeling better.” Padre Pio made a great effort to convince the man of the importance of making his confession. He tried every approach he could think of as he reasoned with him about the matter. However, the man could not be persuaded. Padre Pio thought to himself that desperate cases needed desperate remedies. This was definitely a desperate case. He said goodbye to the man and walked toward the door to leave. “We will meet again but the next time we meet, it will be at the cemetery,” Padre Pio said. The man was shocked at his words and asked for an explanation. “Your doctor has told me that your condition is so serious that you will not last through the night,” Padre Pio explained. The man was then able to understand the importance of preparing himself for death and he immediately made his confession. Padre Pio then absolved him and gave him Holy Communion. The man died peacefully that very night. 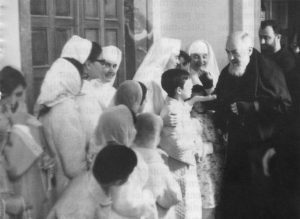 Padre Pio visiting some of the patients at the Home for the Relief of Suffering, San Giovanni Rotondo, Italy. Aurilio Montalvo of Bolzano, Italy visited San Giovanni Rotondo in order to make his confession to Padre Pio and to attend his Mass. He returned a number of times and felt so inspired that he decided to move there permanently with his wife and four children. He bought a hotel close to the monastery and from the income of the hotel,h e was able to provide for his family and take care of all of their needs. Aurilio had a brother who was a nonbeliever. He had never met Padre Pio. He visited San Giovanni Rotondo right after Padre Pio passed away. Shortly before Padre Pio’s funeral, he had a desire to view Padre Pio’s body when it was lying in state. However, it was so crowded in the church that the Capuchins decided it would be best to lock the doors. He was never able to see Padre Pio, not even in death. One day Aurilio and his brother had a talk about Padre Pio. His brother told him that he really had no feeling for Padre Pio. He certainly did not believe that he was a saint. Initially, he admitted that he had felt a certain curiosity about him. But all the talk about Padre Pio left him feeling cold and completely indifferent. Not long after their conversation, Aurilio’s brother walked over to the church of Our Lady of Grace and sat alone on one of the back benches. Suddenly he felt a tap on his shoulder and heard a stern voice. He turned to see who it was but there was no one there. He became frightened and immediately got up and moved to another bench the church. A second time, he heard an authoritative voice and felt someone touch his shoulder. He looked in all directions but there was no one there. He was so frightened that he broke out in a cold sweat. He had no idea what was happening. The next time Aurilio saw his brother, he heard every detail of the unusual story. “How does someone go about making their confession?” his brother asked. Aurilio was happy to talk to him about the sacrament in great detail. “How does one prepare himself to make his first Holy Communion?” his brother asked. Again, Aurilio was very glad to explain it to him. That night Aurilio’s brother had a dream. Padre Pio was standing beside him with a Rosary in his hand and taught him how to pray. The dream marked the beginning of his conversion. Right after that, he asked to be received into the Catholic Church. From that time forward, he lived a very devout life. I have been meditating on the story of the prodigal son. It is a story about returning. I realize the importance of returning over and over again. My life drifts away from God. I have to return. My heart moves away from my first love. I have to return. My mind wanders to strange images. I have to return. Returning is a lifelong struggle. . . God’s love does not require any explanations about why we are returning. God is glad to see us home and wants to give us all we desire, just for being home. . .so why delay? God is standing there with open arms, waiting to embrace me. He won’t ask any questions about my past. Just having me back is all he desires.